Last week when I first posted about finding the Dot available with Quantity discounts a friend asked if that would be the best deal on Dots during Thanksgiving. Obviously I have no insider knowledge when it comes to Dot pricing but since I just read an email from Amazon with even better Dot pricing today I felt like I should let everyone know about it. 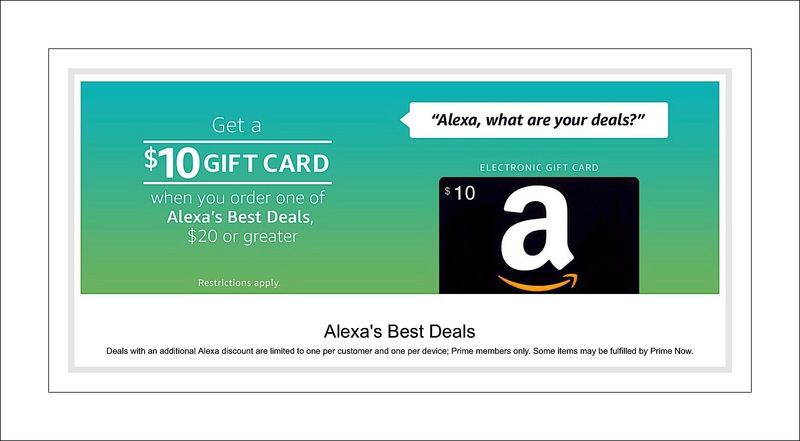 In addition to the these great Cyber Monday prices…if you order using Alexa you’ll receive a $10 credit or gift card just for trying out this new way of ordering via your voice! 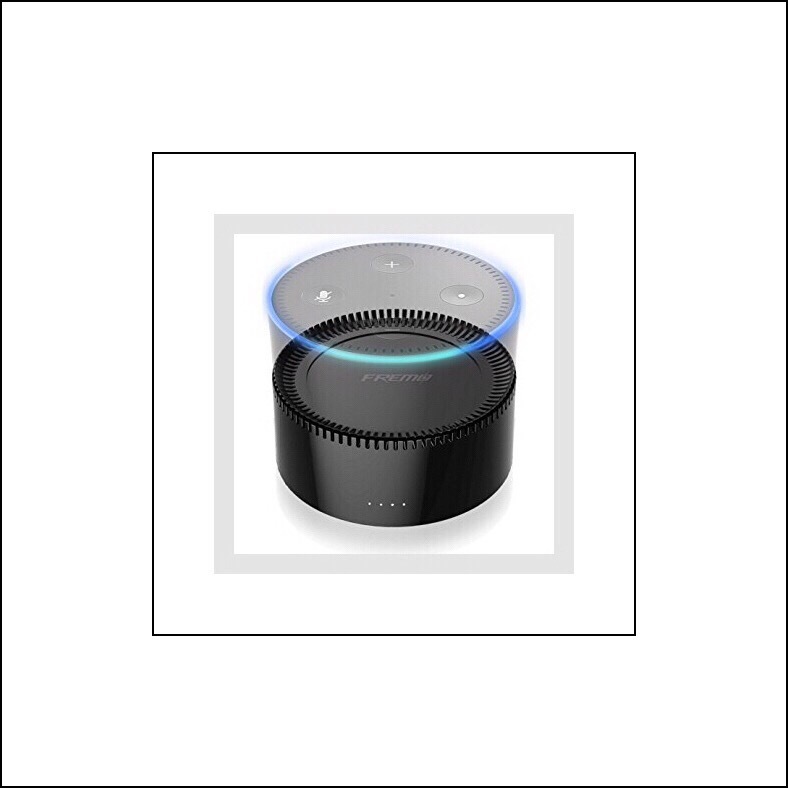 Here’s a link to the YouTube video today demonstrating voice purchasing Using Alexa. If you already use Alexa in your home (similar to Siri but available in a standalone tower that functions as a great speaker too) you recognise how useful Alexa can be…even without Google searches! In this fast paced world knowing immediately what I should wear for today’s weather and having the fastest, easiest alarm to set in the world are my 2 favorite uses…a 3rd is finding local times for movies. Alexa is fast and convenient…more so than Siri…minus the Google searches of course! 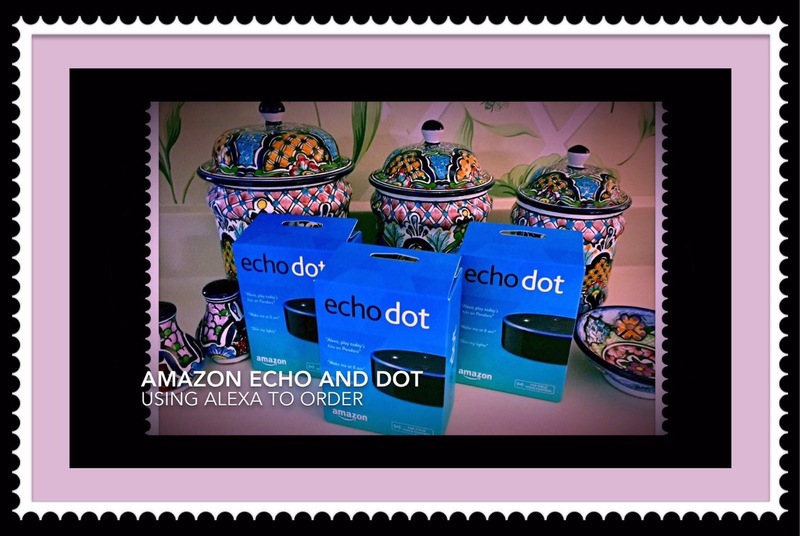 But the Echo, normally $179.99 (available today for $139.99 if ordered via Alexa in black or white) can be a little too pricey for placing Alexa all around your home. That’s where Dot comes in! It does everything that the Echo does but in a tiny footprint and at a fraction of the cost! Why is Dot so Great? Last week I wrote a post because I was so excited to see that Amazon was now offering Quantity discounts for purchasing multiple Dots. I was excited because I’d lost out on getting a deal on the first gen Dot. Plus that it’s a brand new 2nd generation device with a lower price tag and a smaller footprint too. 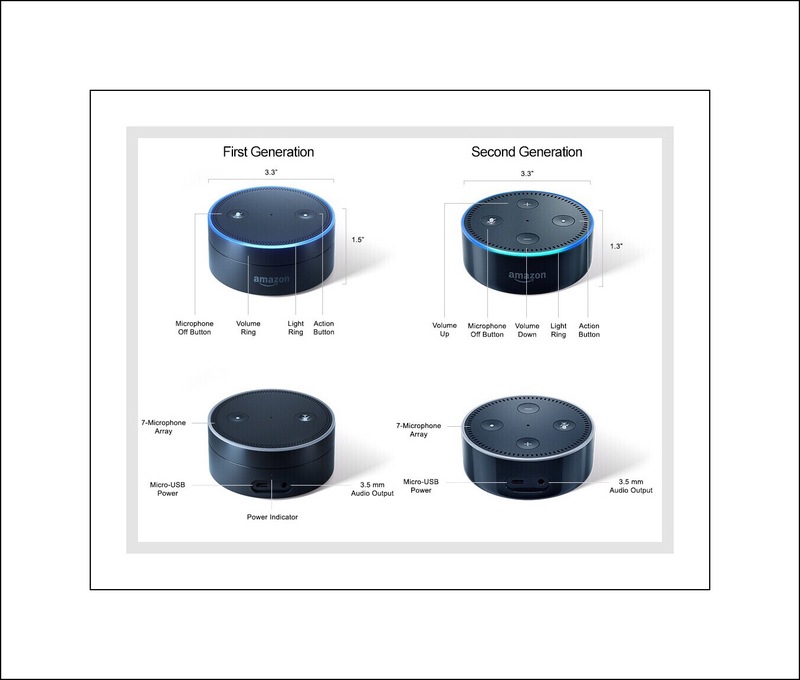 That’s why I love the Dots so much…and with the Quantity discount you can afford to strategically place Alexa in all the best locations around your house for both the functions I already mentioned as well as many smart home features we’ve yet to delve into much. So, Cyber Monday Deals for Dot are truly the best I’ve ever seen today…$39 for a black or white Dot…which may possibly be combined with the Quantity discounts I wrote about last week….although I’m not sure on that part. 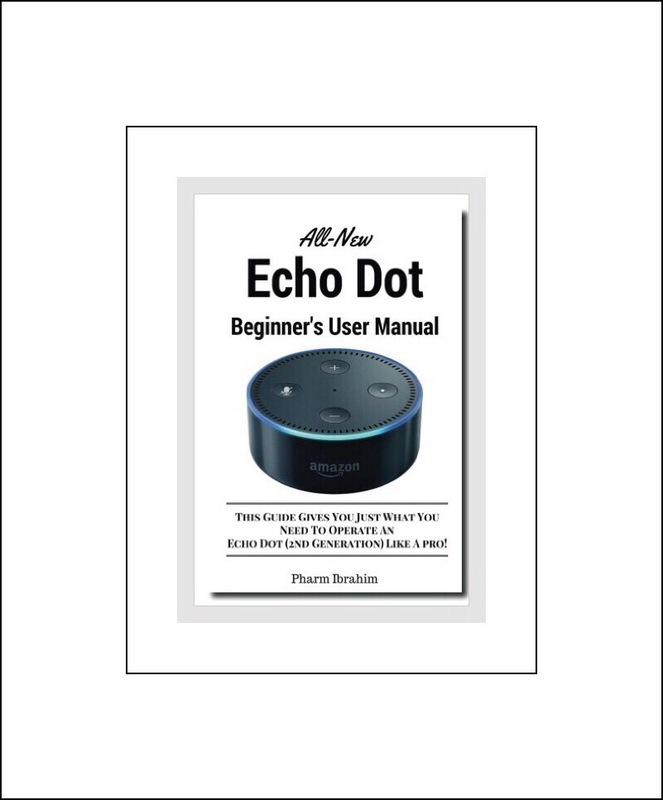 Again this price is if you order the Dot via Alexa. Here’s a link explaining more about the quantity purchasing discount deal. 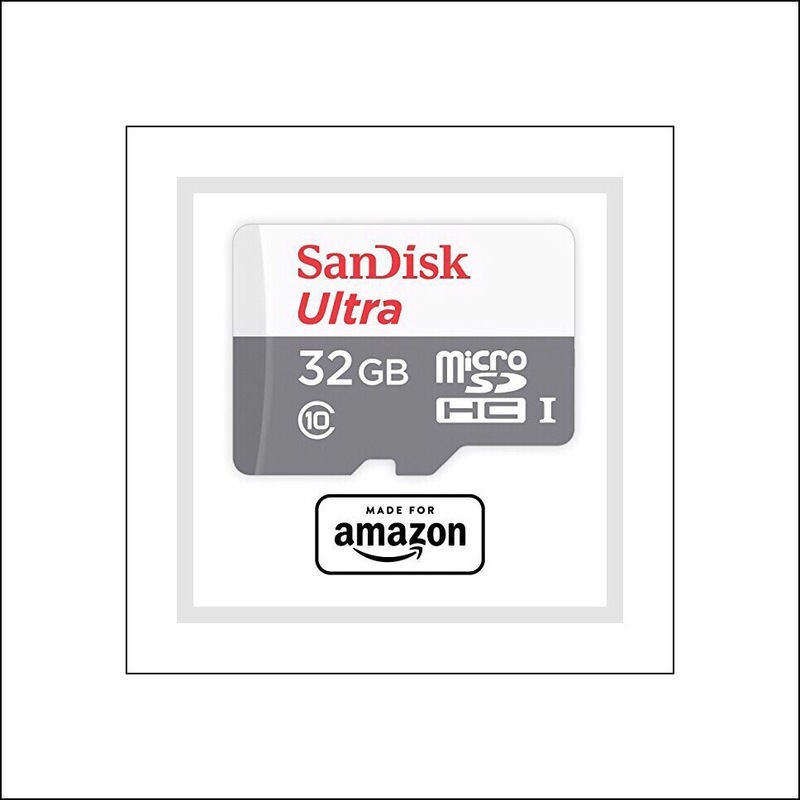 Amazon doesn’t give a time frame for how long this option will be available but I suspect it will end as they deplete their inventory. One reason that I don’t own the Dot yet is because I ran across a great deal for it (the gen 1 version) a few months back, which I learned about one day and decided to take advantage of it the next. Sadly, the next day that deal was no longer available. In retrospect, because gen 2 just came out this was actually a blessing in disguise! First go to the product page for Dot and enter 3 (6 or 12) in the Quantity field before you click on add to cart. Then go to your shopping cart. If you forgot to update the Quantity you can do that in the shopping cart too. Next copy and paste the appropriate code (example DOT3PACK) right above the shopping cart…into a small box that appears under Payment Method…then click on Apply. You should notice that the price in your order summary has changed to reflect the discount. Then click on Place Your Order. This isn’t intended to be an all inclusive listing of all the Cyber Monday Deals. It’s primarily a list which includes my favorite device deals, devices that I know certain family members or friends may be interested in…or in a few cases deals which I plan to take advantage of myself. To make sure I don’t forget anything I may be redundant with a few items! Note that I’m an Amazon Associate so my immediate family members cannot order using these product links because I earn a small commission on a purchase. I ran across this really cool battery base for the gen 2 Dot…making the Dot really portable! 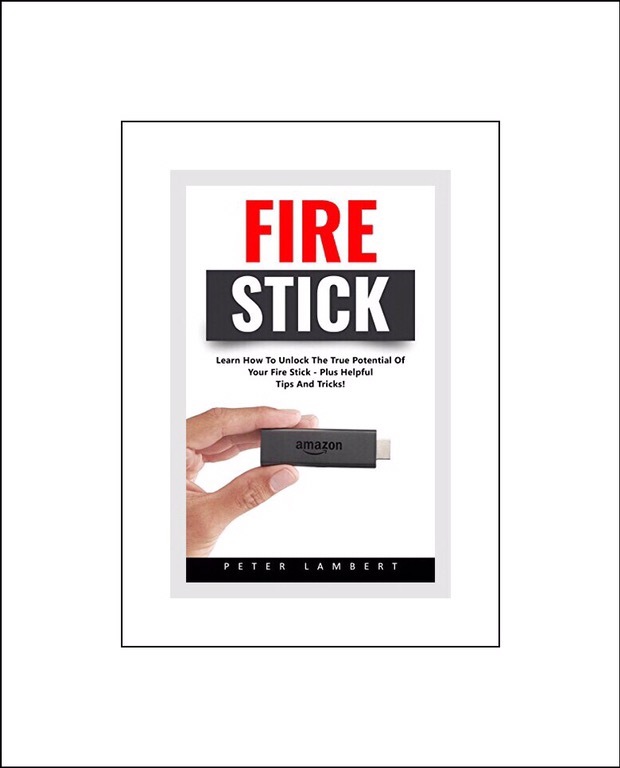 It’s available for pre-order but won’t actually really be available until Dec. 31st…so not in time for Xmas. Which makes me wonder if I should pre-order this one or look for one that’s currently available for our upcoming Xmas cruise. But I really like this one because it’s cool looking, the gen 1 model got great reviews, and the company that makes it makes good products. So I’m still trying to figure that out…but this Cyber Monday pricing is definitely making it a contender! 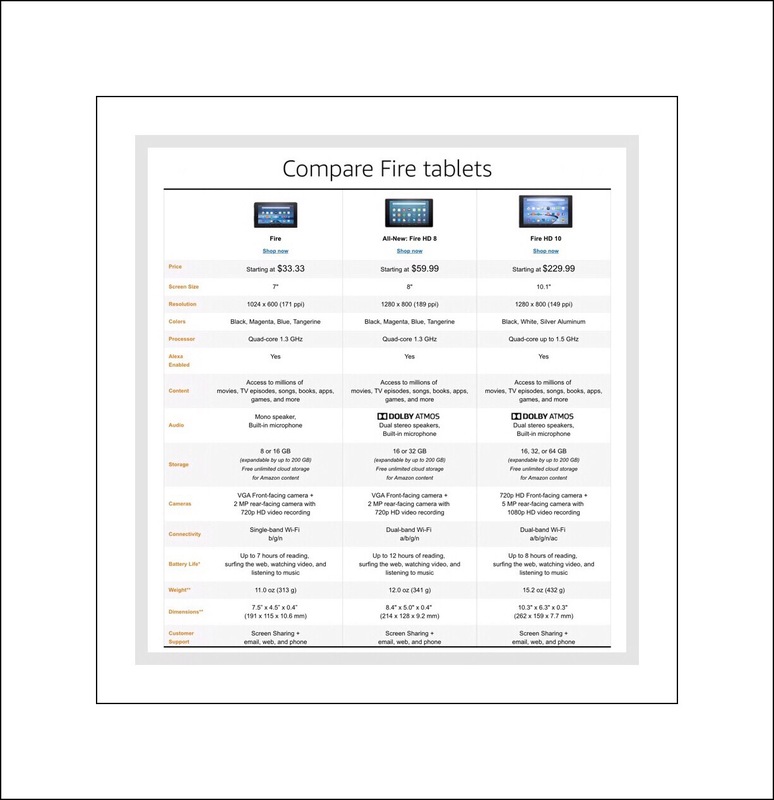 Amazon’s 7″ tablets are the smallest they offer and slightly older technology (5th gen) as compared to their newest HD Fires that come in an 8″ and 10″ size. 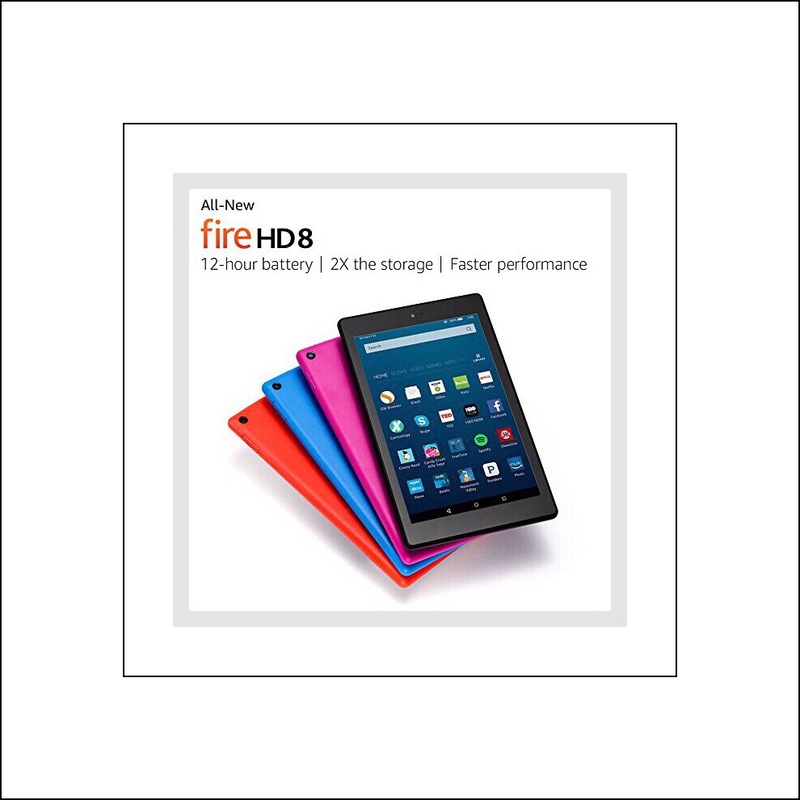 The 7″ model comes with 8 or 16 GB’s of storage and only offers WiFi connectivity. Whereas the 8″ table is called an HD display which offers a higher resolution display and more onboard storage…16 or 32 GB’s…but still only WiFI connectivity…although newer standards for those. Support didn’t really shed any light on the mystery however…but they did enter a Problem request on my behalf….which frankly I’ve forgotten to look for the response to! But this because less of an issue for me when I figured out that I could add Google Play’s App Store without having to root the tablet or having to do anything technically challenging. Doing so opens up a whole new world of possibilities and for me, makes the inexpensive tablet well worth its price. I purchased the ‘with Ads’ version because the prices were so great and they are a total nonissue because they just appear on the lock screen…and they don’t seem to have any impact on our bandwidth. 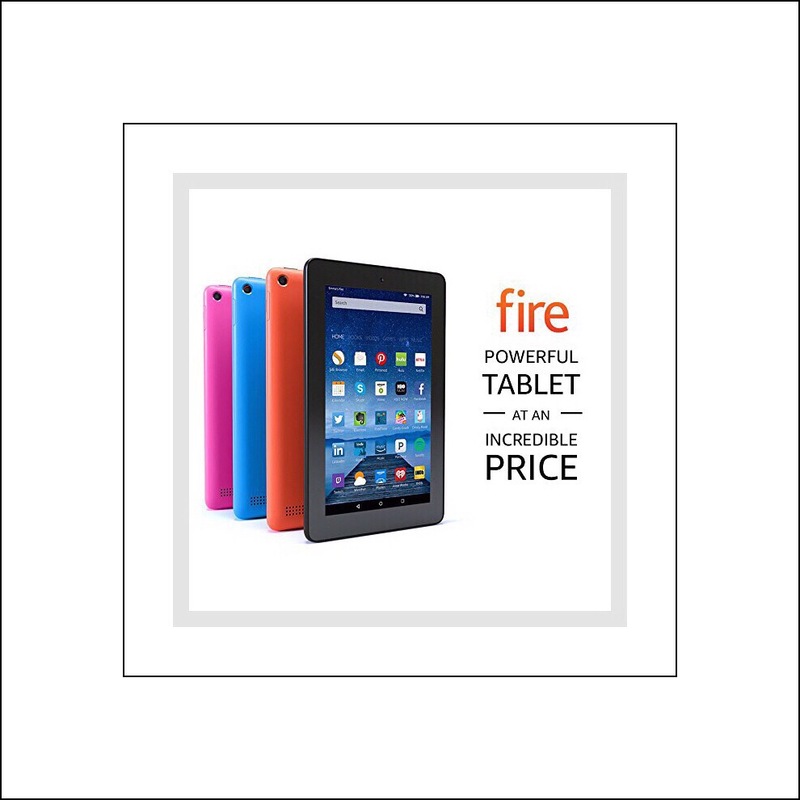 Amazon doesn’t appear to have a Cyber Monday deal for the 10″ tablet…but I can tell you from experience that it’s a rather large tablet, and had I not purposely purchased it for viewing movies and TV shows while traveling (it’s the only device that you can download Amazon content to) I would have gotten the 8″ model instead. Amazon has several great streaming devices that work exceedingly well for finding and streaming Amazon’s free Prime content. Since we cut the cord to our cable provider last month, we’ve been relying heavily on these kinds of streaming devices. 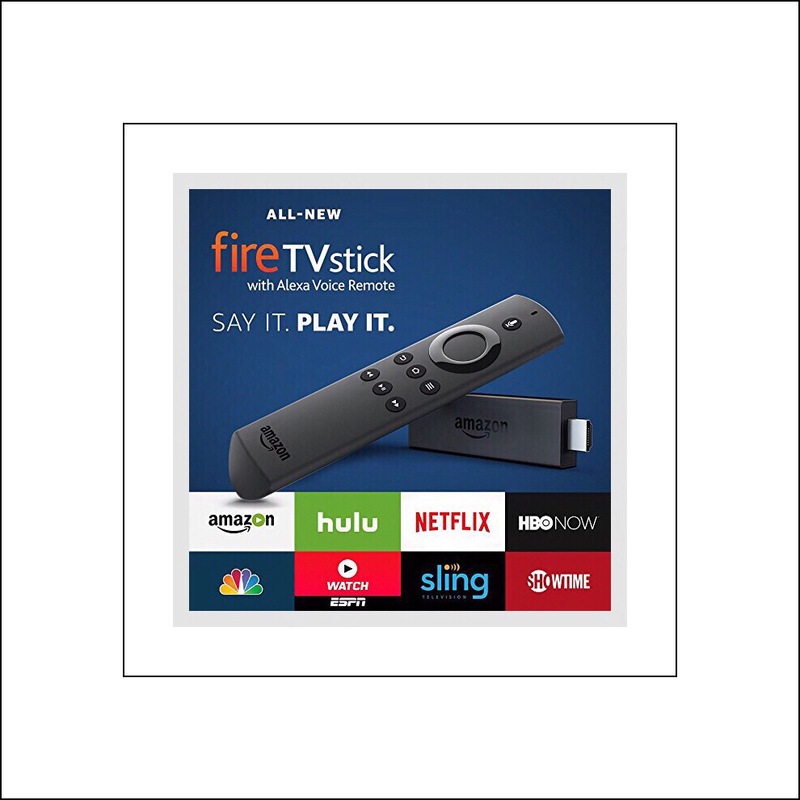 We got Amazon’s regular Fire TV unit, which isn’t on sale from what I can tell but this Fire Stick device, which competes head to head with Goolgle’s Chromecast is really competitively priced and offers all of the same great features that our much more expensive box offers. I read almost everything in the Kindle format because I love how well Amazon’s Kindle apps function on iPads, and because Kindle versions of books are almost always about a quarter of the price of a hard copy version. Plus that I’m impatient…when I decide upon a book…I want it now! Since Amazon began in the industry as a book seller…they have perhaps the best availability of any book seller in the world! 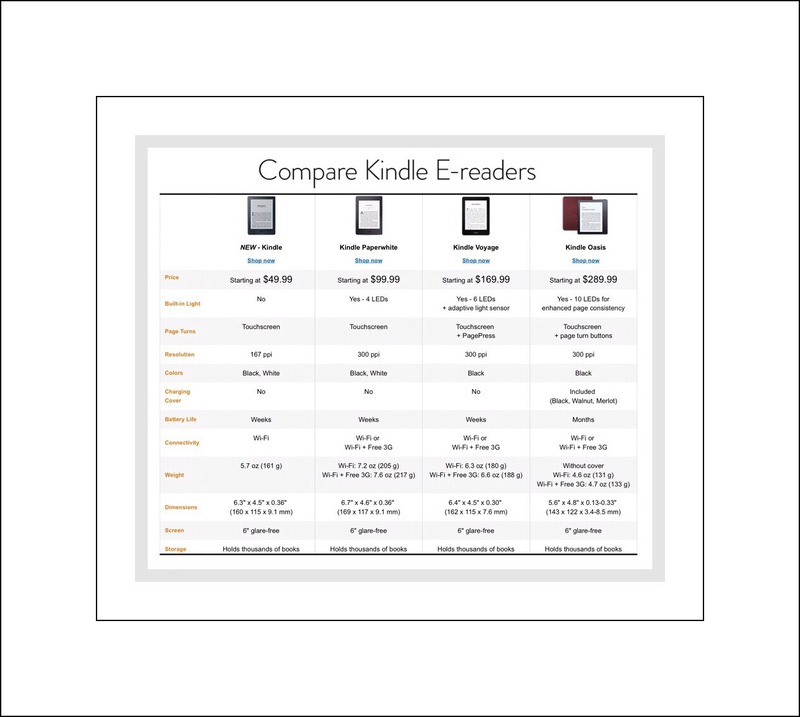 I’ve only ever used one actual Kindle device…which was the original Kindle we purchased for one of my son’s many years ago…after he lost interest in it! But more recently he regained interest…probably because he really doesn’t use any tablets currently, and we subscribe to Kindle Unlimited…which is a great deal for any family that reads a lot! is One Main Reason Why Using Kindles or the Kindle App on Mobile Devices is So Great! 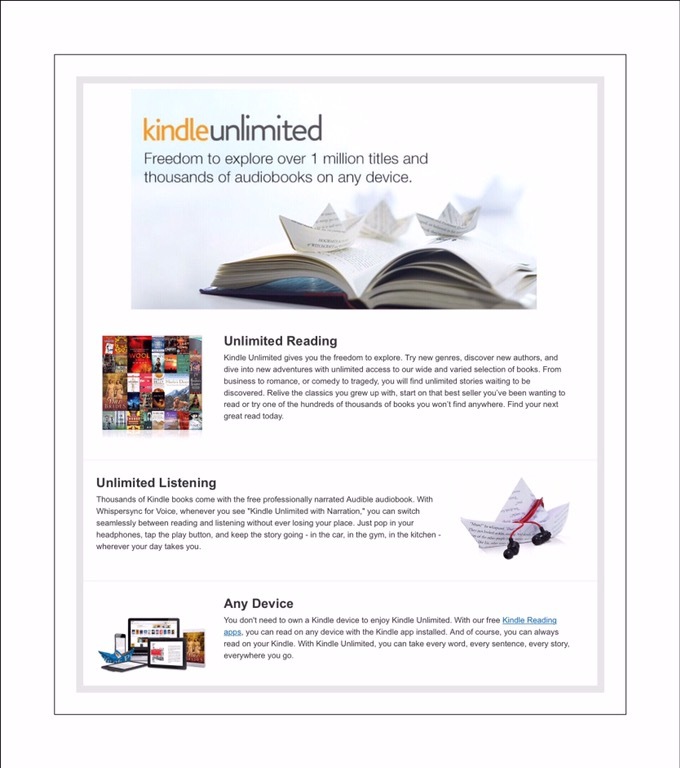 Kindle Unlimited is a monthly subscription for 1000’s of books, audio books and other print content. You can try out the service for 30 days for free and if you like it, it’s $9.99 a month thereafter. 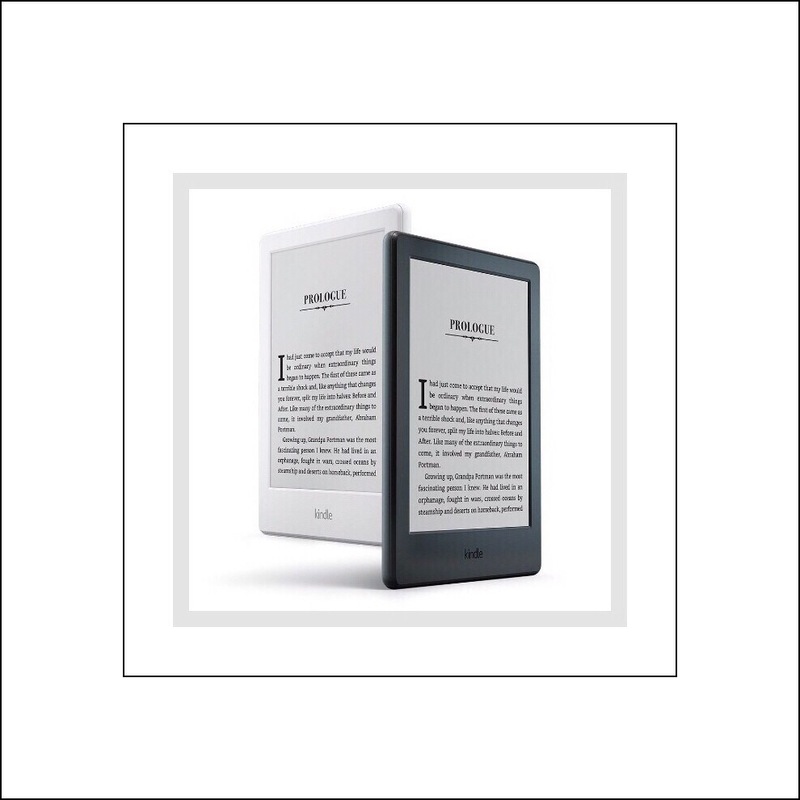 Below are 2 Links to help you find Kindle Unlimited content including magazines, books, Audible narrated books and more. 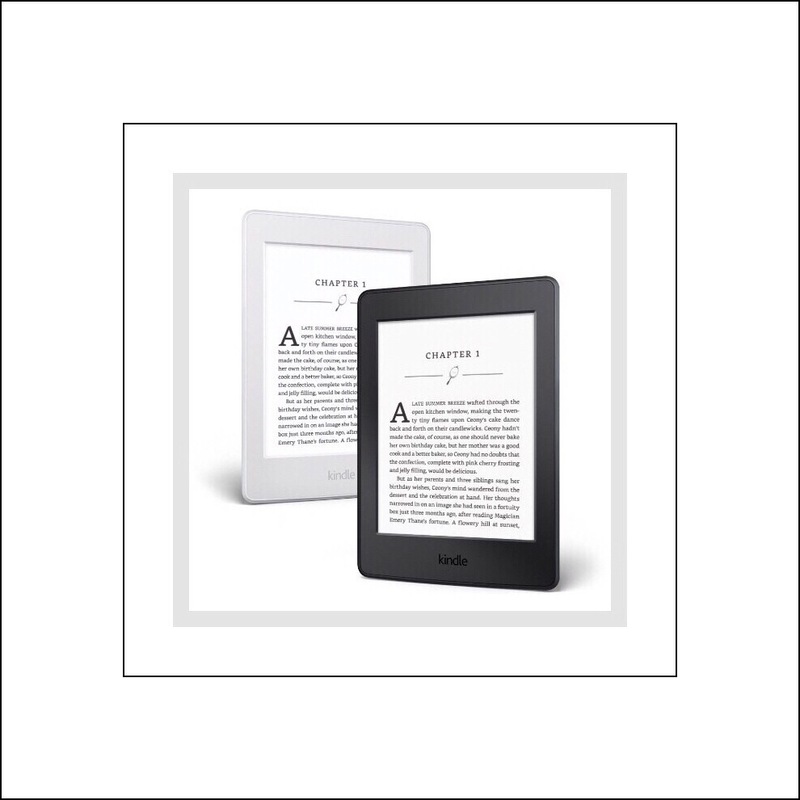 The newest Kindle offers a paper-like reading experience with no blue light disturbances, glare free reading outdoors, but no LED backlighting or no 3G connectivity. 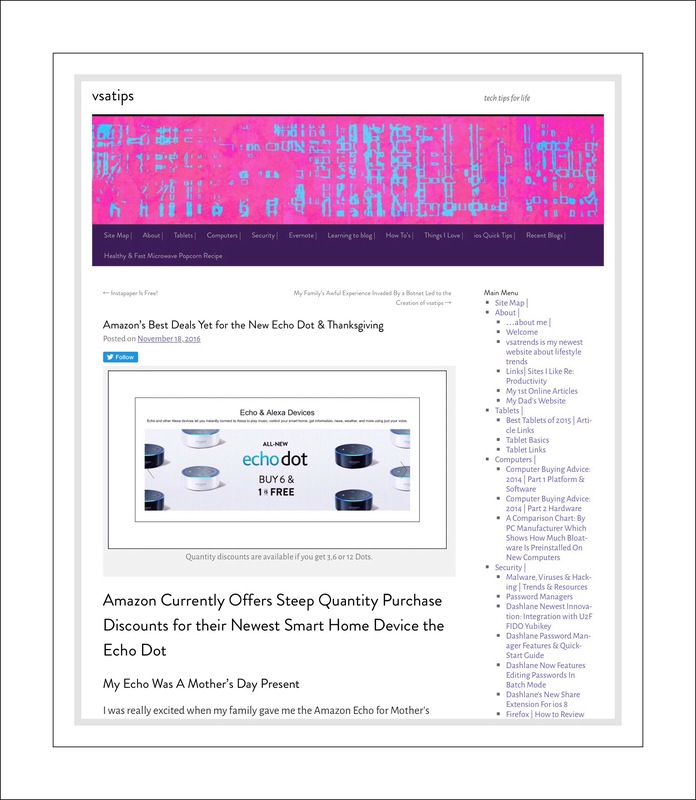 This entry was posted in Amazon, Amazon Prime, Tech Tips and tagged Alexa Deals, Amazon Cyber Monday Deals, Amazon Prime Deals, Cyber Monday. Bookmark the permalink.